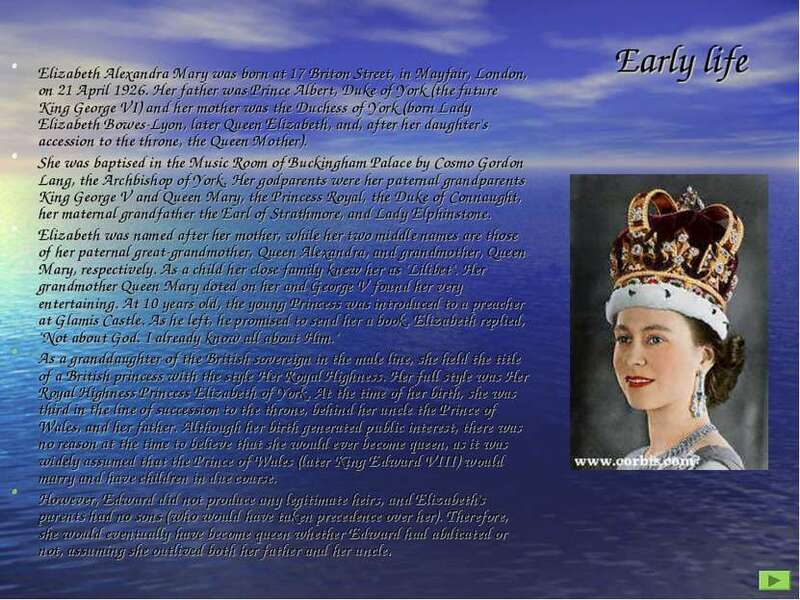 Early life Elizabeth Alexandra Mary was born at 17 Briton Street, in Mayfair, London, on 21 April 1926. Her father was Prince Albert, Duke of York (the future King George VI) and her mother was the Duchess of York (born Lady Elizabeth Bowes-Lyon, later Queen Elizabeth, and, after her daughter's accession to the throne, the Queen Mother). She was baptised in the Music Room of Buckingham Palace by Cosmo Gordon Lang, the Archbishop of York. Her godparents were her paternal grandparents King George V and Queen Mary, the Princess Royal, the Duke of Connaught, her maternal grandfather the Earl of Strathmore, and Lady Elphinstone. 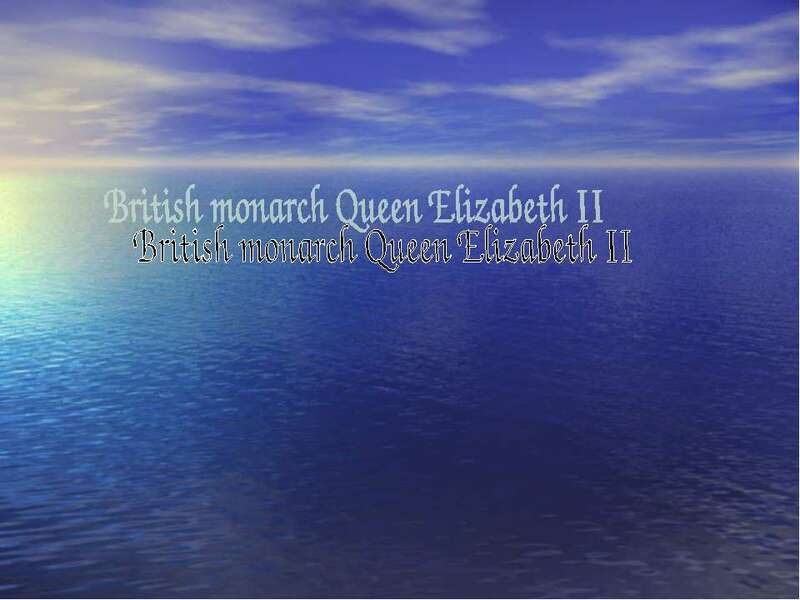 Elizabeth was named after her mother, while her two middle names are those of her paternal great-grandmother, Queen Alexandra, and grandmother, Queen Mary, respectively. 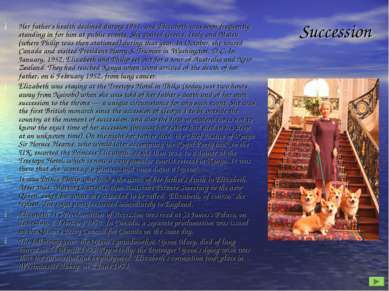 As a child her close family knew her as "Lilibet". Her grandmother Queen Mary doted on her and George V found her very entertaining. At 10 years old, the young Princess was introduced to a preacher at Glamis Castle. As he left, he promised to send her a book. Elizabeth replied, "Not about God. I already know all about Him." As a granddaughter of the British sovereign in the male line, she held the title of a British princess with the style Her Royal Highness. Her full style was Her Royal Highness Princess Elizabeth of York. At the time of her birth, she was third in the line of succession to the throne, behind her uncle the Prince of Wales, and her father. Although her birth generated public interest, there was no reason at the time to believe that she would ever become queen, as it was widely assumed that the Prince of Wales (later King Edward VIII) would marry and have children in due course. However, Edward did not produce any legitimate heirs, and Elizabeth's parents had no sons (who would have taken precedence over her). Therefore, she would eventually have become queen whether Edward had abdicated or not, assuming she outlived both her father and her uncle. 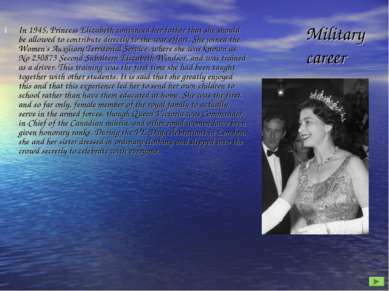 Military career In 1945, Princess Elizabeth convinced her father that she should be allowed to contribute directly to the war effort. 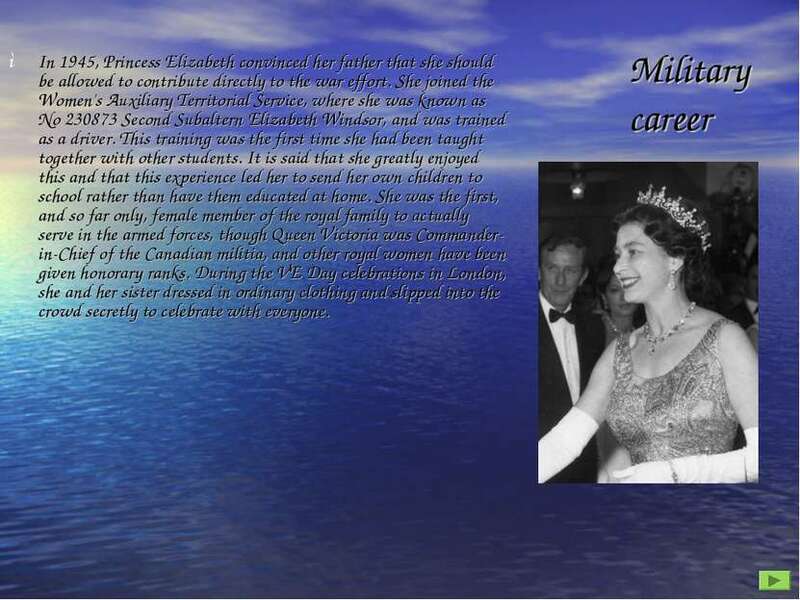 She joined the Women's Auxiliary Territorial Service, where she was known as No 230873 Second Subaltern Elizabeth Windsor, and was trained as a driver. This training was the first time she had been taught together with other students. It is said that she greatly enjoyed this and that this experience led her to send her own children to school rather than have them educated at home. She was the first, and so far only, female member of the royal family to actually serve in the armed forces, though Queen Victoria was Commander-in-Chief of the Canadian militia, and other royal women have been given honorary ranks. During the VE Day celebrations in London, she and her sister dressed in ordinary clothing and slipped into the crowd secretly to celebrate with everyone. Marriage Elizabeth married Prince Philip, Duke of Edinburgh (born Prince Philip of Greece and Denmark) on 20 November 1947. Prince Philip had renounced his claim to the Greek throne and was simply referred to as Lieutenant Philip Mountbatten before being created Duke of Edinburgh prior to their marriage. As a Greek royal, Philip is a member of the house of Schleswig-Holstein-Sonderburg-Glucksburg, the Danish royal house and a line of the House of Oldenburg. Mountbatten was an Anglicisation of his mother's name, Battenberg. The marriage was controversial. Philip was Greek Orthodox, with no financial resources behind him, and had sisters who had married Nazi supporters. 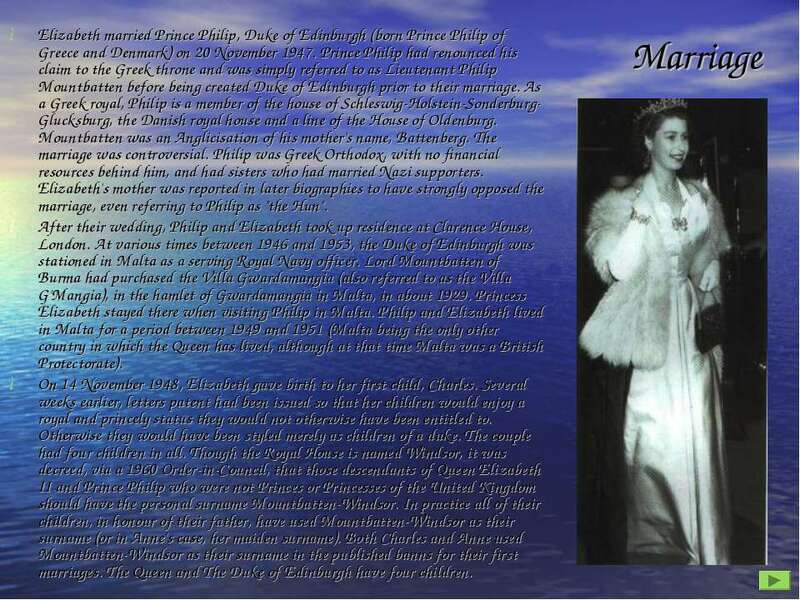 Elizabeth's mother was reported in later biographies to have strongly opposed the marriage, even referring to Philip as "the Hun". After their wedding, Philip and Elizabeth took up residence at Clarence House, London. At various times between 1946 and 1953, the Duke of Edinburgh was stationed in Malta as a serving Royal Navy officer. Lord Mountbatten of Burma had purchased the Villa Gwardamangia (also referred to as the Villa G'Mangia), in the hamlet of Gwardamangia in Malta, in about 1929. 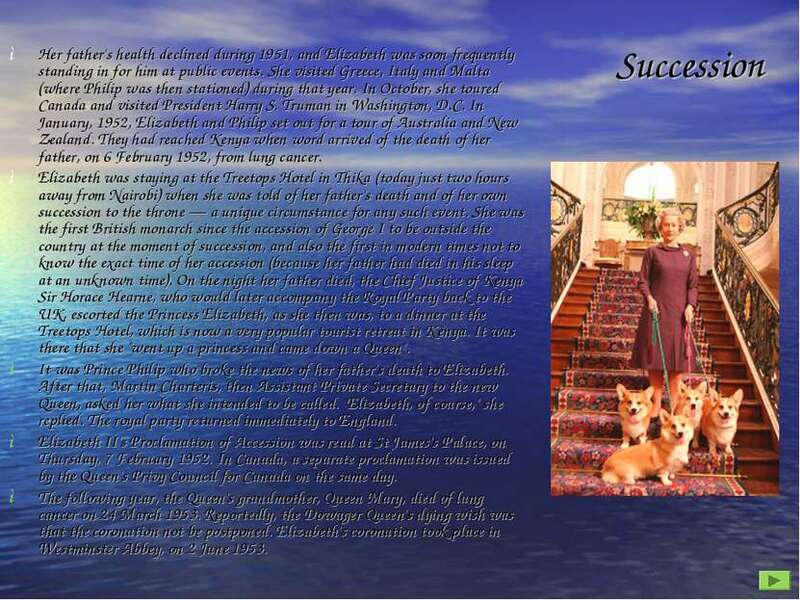 Princess Elizabeth stayed there when visiting Philip in Malta. Philip and Elizabeth lived in Malta for a period between 1949 and 1951 (Malta being the only other country in which the Queen has lived, although at that time Malta was a British Protectorate). On 14 November 1948, Elizabeth gave birth to her first child, Charles. Several weeks earlier, letters patent had been issued so that her children would enjoy a royal and princely status they would not otherwise have been entitled to. Otherwise they would have been styled merely as children of a duke. The couple had four children in all. Though the Royal House is named Windsor, it was decreed, via a 1960 Order-in-Council, that those descendants of Queen Elizabeth II and Prince Philip who were not Princes or Princesses of the United Kingdom should have the personal surname Mountbatten-Windsor. In practice all of their children, in honour of their father, have used Mountbatten-Windsor as their surname (or in Anne's case, her maiden surname). Both Charles and Anne used Mountbatten-Windsor as their surname in the published banns for their first marriages. The Queen and The Duke of Edinburgh have four children. Succession Her father's health declined during 1951, and Elizabeth was soon frequently standing in for him at public events. She visited Greece, Italy and Malta (where Philip was then stationed) during that year. In October, she toured Canada and visited President Harry S. Truman in Washington, D.C. In January, 1952, Elizabeth and Philip set out for a tour of Australia and New Zealand. They had reached Kenya when word arrived of the death of her father, on 6 February 1952, from lung cancer. Elizabeth was staying at the Treetops Hotel in Thika (today just two hours away from Nairobi) when she was told of her father's death and of her own succession to the throne — a unique circumstance for any such event. She was the first British monarch since the accession of George I to be outside the country at the moment of succession, and also the first in modern times not to know the exact time of her accession (because her father had died in his sleep at an unknown time). On the night her father died, the Chief Justice of Kenya Sir Horace Hearne, who would later accompany the Royal Party back to the UK, escorted the Princess Elizabeth, as she then was, to a dinner at the Treetops Hotel, which is now a very popular tourist retreat in Kenya. It was there that she "went up a princess and came down a Queen". It was Prince Philip who broke the news of her father's death to Elizabeth. After that, Martin Charteris, then Assistant Private Secretary to the new Queen, asked her what she intended to be called. "Elizabeth, of course," she replied. The royal party returned immediately to England. Elizabeth II's Proclamation of Accession was read at St James's Palace, on Thursday, 7 February 1952. In Canada, a separate proclamation was issued by the Queen's Privy Council for Canada on the same day. The following year, the Queen's grandmother, Queen Mary, died of lung cancer on 24 March 1953. Reportedly, the Dowager Queen's dying wish was that the coronation not be postponed. Elizabeth's coronation took place in Westminster Abbey, on 2 June 1953.